Tens of thousands of people from across Greece gathered on Sunday at the Constitution Square in Athens, to oppose any compromise by the government with the Former Yugoslav Republic of Macedonia (FYROM) over its name, that will include the word “Macedonia”. The rally was organized by the Pan-Macedonian Associations of the Diaspora (among them Pan-Macedonion Association of the United States) and Macedonian societies from various parts of Greece. The main speakers were composer Mikis Theodorakis, Yiorgos Kasimatis, Emeritus Professor of University of Athens, Constitutional Law, and the metropolitan of Syros Dorotheos. Greetings were also offered by representatives of the organizers and other organizations, among them the President of the Pan-Macedonian Association of the United States Stelios Kirimlis and the President of the Federation of the Hellenic Societies of Greater New York Petros Galatoulas. Dimitris Filippidis, Vice President of the Pan-Macedonian Association presented the speakers. In a replay of what happed two weeks ago in Thessaloniki, organizers and police disagreed on the number of the participants. Police officials estimated the attendance at 140,000, posting aerial photos as a proof. Organizers, claimed 1.5 million. Hundreds of charted buses brought protesters from Macedonia and other distant provinces of Greece, but the number was a small fracture of the over 2,00 the organizers were expecting. 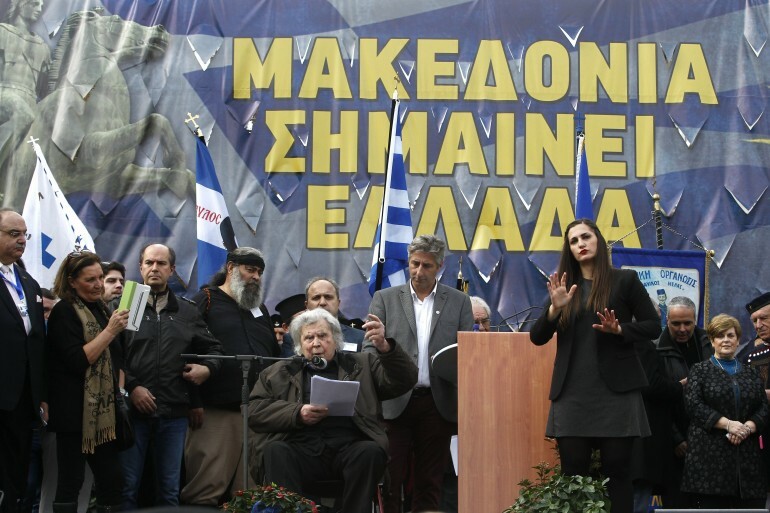 “We are calling on deputies, who have the right to ask for a referendum, to raise the issue in Parliament and activate this issue of national importance,” composer Mikis Theodorakis said on Sunday during a rally over the FYROM name. 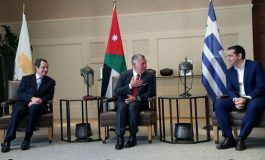 “We are the only ones who can or cannot give FYROM people the right to make theirs an integral part of Hellenism, through the use of the term Macedonia,” he underlined. “I firmly believe that we must deal with this great problem united. 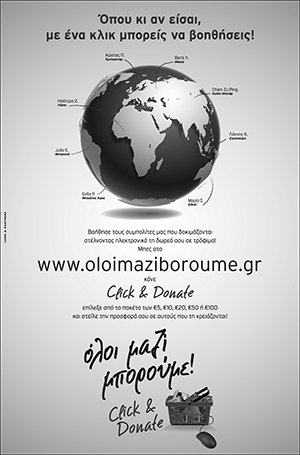 And I firmly believe that we are united because despite our differences, we are all patriots,” Theodorakis stressed. “There is a political decision to give our identity to strangers,” said Professor of Constitutional Law, Yiorgos Kassimatis, who was a keynote speaker on Sunday in the rally over the FYROM name issue at Syntagma square. The rally was peaceful but small clashes occurred between the police and members of ANTARSYA group. Police made use of tear gas. About 700 left-wing and anarchist protesters set up a counter-demonstration nearby, bearing banners calling for Balkan unity. 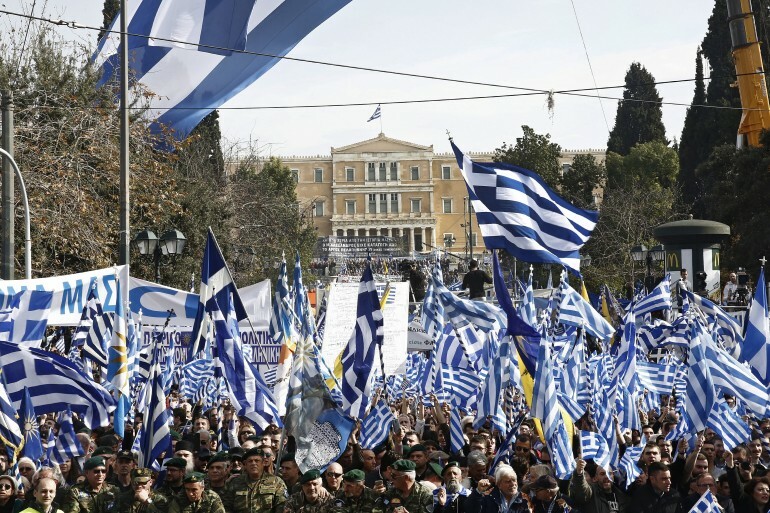 The participants of the rally were chanting “Hands off Macedonia!” and “Macedonia belongs to Greece!” A huge Greek flag was displayed on the Syntagma Square. “The government focuses on national interest, moderation, prudence and insistence on clear positions aiming at cooperation, understanding and co-development,” the prime minister’s press office said on Sunday, adding that a different attitude would only lead to a national defeat. 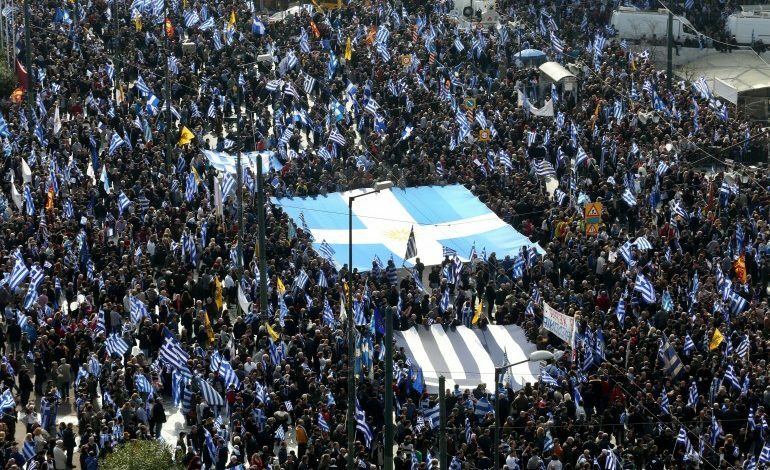 According to the announcement, the rally over the FYROM name issue gathered several thousands of citizens at Syntagma square and the organisers, Mr Samaras and Mr Mitsotakis’ estimates for millions of protesters proved wrong. 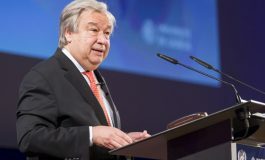 The announcement also said that the majority of the Greek people considered that the major foreign policy issues must not be dealt with fanatism and intolerance. Foreign Minister Nikos Kotzias posted an announcement on his Twitter account on Sunday regarding the rally over FYROM name issue, stressing that he would continue to negotiate for the country’s interest. “All these people that protest over the FYROM name on Sunday are certainly worried about this national affair, but also express their concern over the way that the government is handling the issue,” main opposition New Democracy (ND) vice-president Costis Hatzidakis said in an interview with the Athens-Macedonian News Agency. Hatzidakis said that the statements by Skopje’s Foreign Minister Nikola Dimitrov and UN negotiator Matthew Nimetz last Thursday on the issue of national identity “blur the image even more”. The Greek government “is attempting to give a patriotic solution to a problem that affects the country, international relations and diplomacy for more than 25 years,” government spokesman Dimitris Tzanakopoulos said on Sunday in an interview with newspaper ‘Realnews’. 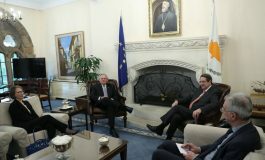 He noted that the government has specific principles that protect the national interests in the negotiations with FYROM government. “Our intention, therefore, to put an end to a long-lasting issue with the neighbor country is given and expressed,” he said, explaining in this way that the will and the government’s policy on the solution of the problem will not be affected from the rally.